There are barely 4 of them, but already managed to engage Udinese supporters in discussions over the future of Stadio Friuli. We mean seats, first few seats installed at the north stand. In total there are six, but four are blue. Why blue? Good question, this is why fans have been speculating over possible colour configuration. And the answer is rather simple: “It’s just a test. There are prototypes we used to decide on eventual positioning and visual impact of various seat models. We’re now waiting for further seats of various shapes and colours for further verification”, said Alberto Rigotti, managing director of Udinese Calcio. At the same time he revealed no final decision has been reached as to the final pattern of the seats, nor their colours. One thing the club is opting for is creation of a mosaic. This way the stadium wouldn’t feel visually empty even with not many people inside. 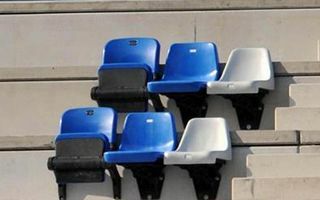 Inclusion of the name Udinese Calcio within the seating is still possible, which was welcomed by many supporters. Udinese have already reached the maximum height of their new north stand (not including its future roof). It’s one of three new sections that are being created at Stadio Friuli in a makeover from large athletic stadium to a smaller, football-only venue. From 41,600 its capacity will fall to just under 30,000 seats. The north end is currently the most advanced section.